I once invested in Armour Residential (ARR) for high income. It was at the time when this stock traded at $8 – $10 range in 2009. Today, this company is down low at $3.40 a share and it looks like it is going to die after a long agony. I invested in this stock excited about great dividends, but failed to see that this stock and company is a trap. At that time I didn’t know much about dividend sustainability. I didn’t know or ignored that high yield not always mean security and learned the hard way that dividend cuts may ruin your investment. The price drop will in all cases exceed your dividend income you received and you always lose in the end. Although dividend investors do not care much about their portfolio value as they cherish income it produces, you still do not want to be sitting in a losing position and hoping that one day it may recover. Some investors even throw more money against their bad holding to cost average. But constant dividend cuts will catch them. Always. I am not talking about stocks that are good dividend payers, increase dividends regularly and have a proven history of doing so. Then a large price drop of such stock is a life time opportunity. Unfortunately Armour Residential isn’t such a company. In 2013 I decided to take a loss and walk away from ARR. Now, I am glad I did it. I closed my trades at around $6 a share at that time. Today, the stock is trading at $3.40 a share. Those who hoped for a recovery and great dividends are probably disappointed. Although I do not invest in this company anymore, I still time to time look at it to see how my past assessment worked. Was I correct or wrong? I also time to time check discussion boards to see what other investors think. And I still receive news about this company into my inbox. When I was selling my positions in ARR, one of my reasons were that the managers showed in many occasions that they didn’t care about investors, but themselves only, unlike other dividend payers, compare it with Realty Income for example). If a co-founder and one of the directors liquidates all his position in the company, what does that tell you? Are the rats leaving the ship? 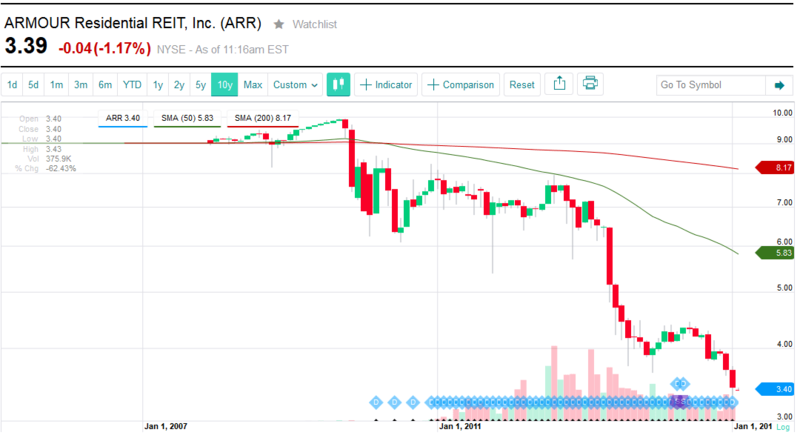 Thanks for sharing this painful story about ARR and the perils of chasing yield. Too often I see high yield names in other dividend portfolios and think to myself that many of these names are time bombs waiting to explode. Look at the agony of ARCP in recent months. I may not have the most high yielding dividend portfolio you’ll see online but I do have a sustainable yielding portfolio and that’s what matters most along with dividend growth. Kudos for taking a loss and walking away when you did. Many times investors hold on to the bitter end and lose out on almost their entire investment.